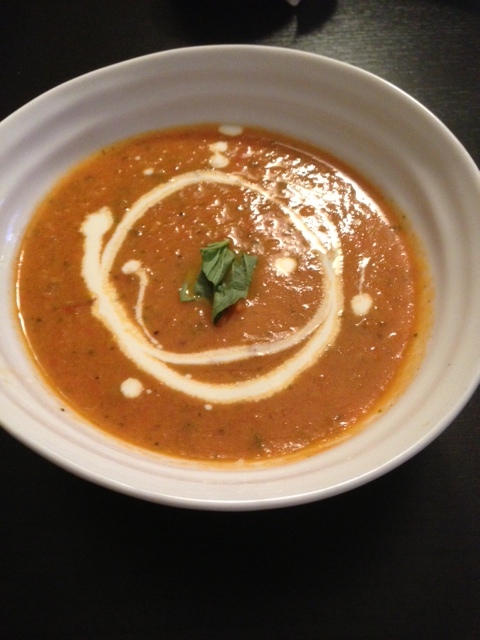 Roasted Tomato and Basil Soup | So Hungary! There is nothing better than enjoying a hot bowl of soup on a cold, winter day. I especially love tomato soup – it reminds of my childhood. I used to love eating tomato soup, crumbling saltine crackers on top of it and dipping my grilled cheese sandwich in it. Who else did that with their soup? This version of tomato soup comes from Ina Garten/Barefoot Contessa and is a more elegant and grown up version of tomato soup. There is so much flavour from the basil and red pepper flakes, you will be filling your bowl with seconds and thirds. Preheat your oven to 400 degrees. In a large bowl, toss the tomatoes with 1/4 cup olive oil, salt and pepper. Place the tomatoes in a single layer on a baking sheet, and roast for 45 minutes. Once tomatoes are almost done roasting, you can continue with your soup. In an 8-quart stockpot on medium heat, sauté the onions and garlic with 2 tablespoons of olive oil, butter and the red pepper flakes. Sauté the ingredients for 10 minutes until the onions are translucent. Add the canned tomatoes, basil, thyme and chicken stock to the pot. Add all the roasted tomatoes, as well as the juices they left behind on the cookie sheet. Bring everything to a boil and simmer for 40 minutes uncovered. At this point, there are 2 ways you can finish your soup. You can put the soup in a blender and blend until smooth. This will give you a smooth and creamy soup. You can also use an immersion blender in your pot to break up all the large bits. This will give you a more textured soup, but equally as delicious! I hope you will enjoy this soup as much as we did this past week!